So … there’s another range of Barbie makeup on the market, after both MAC and Stila have released Barbie collections in the last couple of years, this time New Look are on the case! I’ll be honest, and let you know that this was something I wasn’t really that interested in featuring on the blog – I’m definitely not New Look’s target market these days – as I wasn’t (still not to be honest) convinced that this would be something my readers would be interested in. It’s a budget range, from a budget store, and it wasn’t something I’d tried. Add in that I’m not entirely sure I approve of grown women using Barbie as a role-model for their looks, and you have no small amount of confusion. I was a Sindy girl (moving onto a Girl’s World the second I had a chance – I ruined her, and don’t even get me started on the crappy crayons they called “makeup” in those days!) and Barbie’s plastic-fantastic looks and lifestyle I always found a little … well … flashy. So I was bemused when both Mac and Stila brought out ranges based on Barbie (what next, Bratz?) and ignored them completely, thinking they were for – frankly – those misguided middle-aged women who are clinging onto their youth like a limpet*. Certainly that’s who the price ranges and brands involved seemed to be aiming themselves at. Retro-irony is not a bad thing, but … well, Barbie is famous for blue eyeshadow and pink lips, it’s hard to pull that look off, even in an ironic fashion! *No offence intended to the people who bought them and loved the products, it’s my own prejudice I’m highlighting here, not the tastes of anyone else! There is also a face pack, a blusher which looks very high end (I didn’t see this, so can’t speak for it’s texture or anything), a mascara, eyeliner and concealer pack which I haven’t tried yet, but will have a go at playing with soon. These aren’t products I’d personally buy for myself, but if my niece were a few years older, I’d be happy to buy her some, and have her play with them to her heart’s content. They’re nice products, not great products. What’s your opinion on Barbie, and Barbie products for adults? I saw this in my local, but there were no testers- in fact all the boxes were sealed so you really couldnt see what was in them. Put me off big style! Thanks for the post. 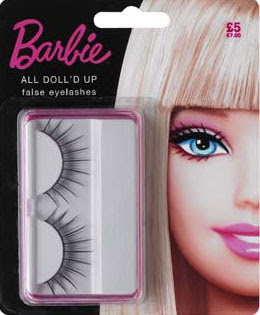 Not convinced by Barbie makeup, I'd buy it for a teenager I guess. But it doesn't scream glamour to me. Whatever you buy, the original barbie doll get up can not come into a human face. But good collection of cosmetics.